Pro-Car Brochure...My Criterion - Friends of the Professional Car Society - Official Website of the Professional Car Society, Inc. I heard rumors M&M was in such a rush to get the Criterion brochure out to the dealers they used the 73 prototype but doctored it up to look like a 74. Now, I just received a 74 Criterion brochure and matched the pictures from it to the ones on the M&M Chapter website featuring the 73 prototype. Have to say, the 74 is not the 73.
goes to show don't believe everything you hear in the parking lot over cigars and beer. How can you tell? The 74 in the brochure sure looks like it could be the 73. The only difference I can see is the grille/bumper/headlights, which look rather obviously edited on the brochure, especially the far left headlight. Everything else looks the same to me. 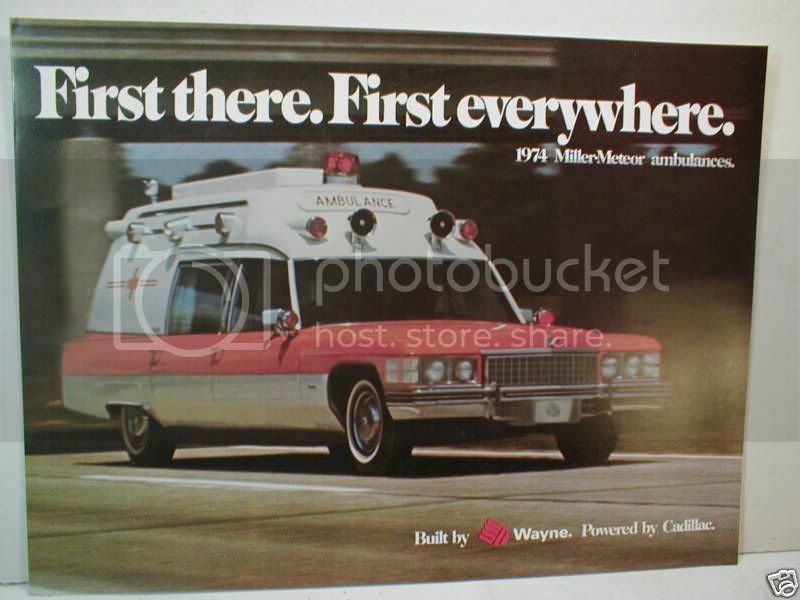 I gotta say, given the fact that the '73 (below) and the one in the ad for '74 had the same colors, same side lights, same single beacon, same red spotlights, same whitewalls, etc. etc., it seems quite possible to me that the photo for the brochure is the '73 prototype with a '74 front end airbrushed in. True, they could have built one just like it in early '74, but.... This is how things work in advertising. I think I have a clear shot of the flier. then again maybe it's not much better. Open the brochure and look at the large, driver's side view of the Criterion inside. Take a close look through the windshield at the dashboard. You will see the contours of the 1973 dash, along with the tip of the gearshift lever, which stands nearly straight up in 1973. This was the ultra rare 1st 74 Criterion built that was used for the brochure (not really). I just wanted to post this so Richard could cry in his Fruit Loops over breakfast for the next 2 weeks. The car is LONG gone.....NO I dont have any parts from it ( I sold them all years ago), NO I dont know where the parts are today....The happiest memory I have of this car was making my driver drive it home for me and hearing him cuss my name all the way because he got showered with 300 lbs of rust falling out of the headliner and interior windshield trim (which fell off too). This pic was taken the morning the car went to the crusher. While we are on the Criterionoligist kick...Tony K....didya see this one a few weeks ago? Note the lack of roof or side lights. Just loading lights. WHAM, BAM, POW!!! Holy Criterion Batman (Cary) that is some awesome picture. Thanks for the post. When studying the pictures from the M&M Chapter on the 73 Criterion and the pictures from my 74 Criterion brochure, the inside shot are not the same. For instance, the seat patterns in the rear do not match, equipment mounted in the attendants area is differnet. Pretty sure the brochure for the 74 is a 74. Scanner does not work so no go on me posting pictures from the brochure but may try it later this week.